Firstly, let’s be sure we’re talking about the same bit of kit. Your router is the little box that houses your modem and where your broadband signal arrives to be ‘routed’ to the various devices that need internet access. This might be wired or wireless. 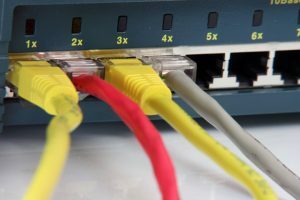 Generally, a router will be installed by your IT company, but if you don’t have a regular IT support service and are planning to replace an old router it’s wise to know what you’re looking for. Network type: this tells you the type of network the router will support and whether the devices you own support it. The older routers may be 802.11n, but the new ones will be 802.11ac and are compatible with both old and new devices. Range: the newer routers have a more reliable connection at longer distances. It’s unlikely that this will be printed on the box or instructions, but worth having a chat with the sales people about whether it will support your proposed set up. Throughput: This is the speed – or at least the speed that the router is capable of. It doesn’t always stack up in practice though so do your research and read reviews to check out the reality. Some manufacturer’s figures are aspirational rather than actual! Bands: Modern routers are usually dual band, this means that everything isn’t trying to use the same band. Dual band routers may have a 2.4Ghz band and 5Ghz band, the newer (802.11ac) routers are all 5Ghz and this is a much better connection as there’s less interference. The only challenge may be that its range is not as good. QoS: Quality of Service is the feature that lets you control usage. You can limit certain devices’ access at specific times so that one user doesn’t hijack all the available bandwidth with huge download demands. It may not be listed in the specs, but it’s wise to ask about the options before committing to buy. Now for the more sophisticated features to look out for. Spatial filtering: This is a clever feature (also known as beamforming)that lets your router sustain strong throughput despite dead spots or obstacles that can block the signal. There’s a lot more to it, but may be worth exploring if you have wireless connection issues in any part of your building. Antennae: Do today’s devices need them? If you need to enhance your signal they can be useful – and small antennae can be replaced with bigger versions to boost signals, but you will need expert advice to establish what you really need to fulfil your system’s requirements. MIMO: Multiple input, multiple output – giving you the potential for improved broadcast and reception – but, again, you’ll need expert guidance depending on your system’s requirements. There are many more terms and phraseology that needs interpreting and translating – some of which is just marketing fluff. Realistically, if you want a robust router that performs at the level you want you’d be advised to get expert guidance.